Toronto hosts Power of Love conference! Parliament of World Religions held in Toronto: the world class Interfaith city Power of love! I had the honor of presenting for the second time at the Parliament- a 100-year-old Interfaith Institution- on my work as a Chaplain as well as my community engagement work with Toronto’s interfaith bodies. It was indeed a satisfying experience given that Toronto was host to such a global family of some 80 countries from 220 spiritual paths. One of the many intriguing wisdom shared by my fellow panelists was the strong sense of peace each faith provides to its followers- the Swami from Hollywood whose Vedanta teachings has impacted thousands of lives and so has the Buddhist Monk Dr. Saranpala from Toronto Mindfulness program and the Satya Sai spiritualist from India influence of love by Dr. Redding. Islam itself means peace and from that derives Salam which means peace. Not always is this the story. Our deliberate efforts over the past decades to share the beauty of our faith in Toronto’s 190 ethnicities makes this world class city unique. 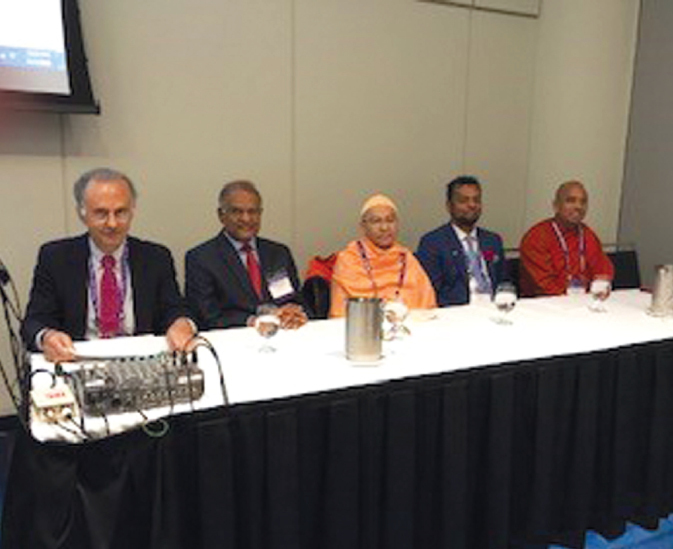 From right inset are Interfaith Panelists Dr. Bhante Saranpala, Imam Habeeb Alli, Swami Sarvadevananda, Dr. Narendranath Reddy, and Anupom Ganguli. It so happened that the 7500 attendees at the conference weren’t only treated to the wisdoms and music of the many spiritual and religious persuasions but concrete ways communities have engaged in peace building. That weekend Nov 1st to 7th thousands joined hands in creating Rings of Peace around synagogues after the Pittsburgh terror attack by a white supremacist. The Ring of Protection was actually started by a group of us- Imams, Rabbis and Pastors when the same brutal fate was meted out to six worshippers at the Quebec Mosque last year. Among the dynamic speakers that represented Toronto are Dr. Hamid Slimi for his on going work with Rabbis and Pastors in seeing to the creation of a better world, Dr. AbueLaish Ezzeldin for winning the peace prize after he forgave the killer of his two daughters in Palestine, Dr. Shabbir Ally for his work with the city synagogues and churches in Interfaith dialogue and Margaret Atwood for her unapologetic attitude towards the deniers of social justice and climate change. When we look at how Toronto sits on the lands of the First Nations and we inherit a land of treaty and occupiers we cannot help admire how much a strong and respectful presence the elders and youths of the Indigenous people were afforded at the Parliament- including keynotes and smudge ceremonies and accountability of the Truths and Reconciliation commission. I was touched that the stories shared by young change makers on their journey from trauma to making a better world reminds me as a new immigrant to Canada that I must not sit idle in ignorance whilst enjoying the fruits of our ancestors and not contributing positively towards the alleviation of the First Peoples’ suffering. I was had actually invited Elders to do the smudging ceremony in our One Love Galas more than once and invited the leader of the Missing Aboriginal Women of Manitoba to address our Ramadan dinner last year because building bridges between Muslims and First Nations is crucial. Back to where we started- the seven-days convention at Metro Convention Centre ended with plenaries and the beautiful dance of one of the many persons I met during the blessed Langar- the Sikhs provided daily free lunches. The Parliament was the meeting of many faces, many hugs, many traditions, and many more Holi colors but like a dance executed with refinement- we are all just one family living together on mother Earth and Peace is our only glue or we will perish! As Rumi said: Leave the Circle of Time and Enter the Circle of Love!